Bosch Tronic 3000 Point of Use Electric Water Heater - US 9 with 9.5 Kw of power. The Bosch Tronic 3000 US9 Electric Point-Of-Use Tankless Water Heater was designed to provide an endless supply of hot water for kitchen and bathroom sinks. 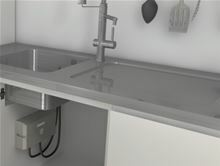 This compact, under sink unit provides 99% efficiency with minimal stand-by loss. Ultra compact and lightweight, the Bosch Tronic 3000 US-9 point-of-use, under-sink tankless water heater is designed for commercial or residential applications and comes equipped with universal horizontal/vertical mounting options. The Bosch Tronic 3000 US 9 Electric Tankless Water Heater replaces the PowerStar AE 9.